We are delighted to announce that we have a new table saw with SawStop technology. This is an important step in improving our member’s safety. We decided it was time to introduce a new “norm” in the way we view safety, especially as we have a wide range of individuals using the shop, from complete novices to seasoned woodworkers. 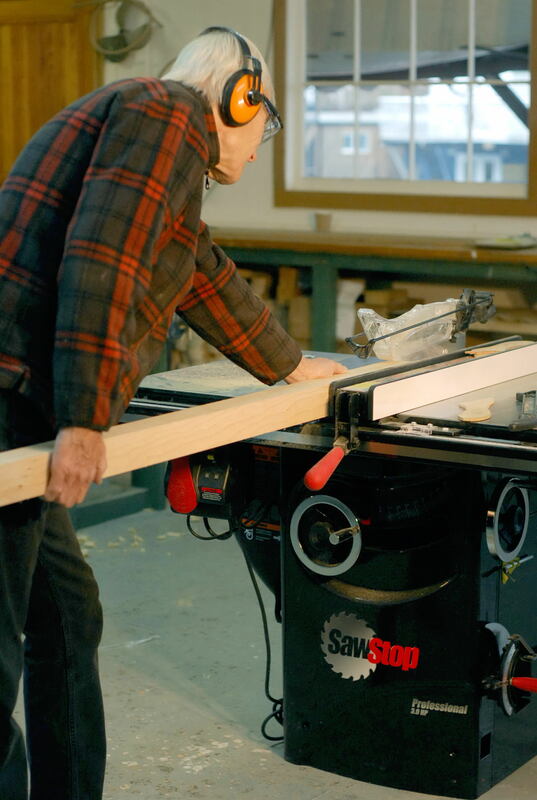 WorkSafe BC is quite clear on table saw safety. “Blade guards on table saws, and to a much lesser degree panel saws, cannot be used in every circumstance. The OHS Regulation allows for the temporary removal of the guard, where its use is impracticable or where the guard itself creates a hazard. The term impracticable means “that which is not reasonably capable of being done.” Impracticable does not mean inconvenient; there should be few situations where it is impracticable to use the guard. Returning to kick-backs, consider that the tips of a 10” blade are travelling at around 220kph, and if the blade happens to catch a piece of lumber because you are not using a riving knife, or a guard with anti kick-back pawls, then that piece of lumber is likely to end up heading towards you at 220 kph! I have seen a sliver of lumber narrowly miss a saw operator and then penetrate 2 layers of drywall! A hard copy of the manual can be found in the rack just inside the tool room door, together with manuals for the other shop machines. Read it and you will learn a few things – I certainly did. Remember that even SawStop technology won’t protect you from kick-backs if you remove the guards! The saw was assembled with Collin Craig’s help and we were both very impressed by the build quality of this machine and we are sure you will all find it a pleasure to use. We have some quality equipment in the shop for member’s use. There are still things we need to improve, and a few more tools that we would like to have (aren’t there always!) and those will come in good time.